"This was a totally different direction for me. 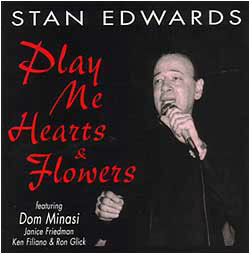 Stan Edwards wanted lush arrangements behind his singing, so I re-harmonized everything. The hard part for me was trying to conduct and play at the same time..I couldn't do it, so I conducted and put in the guitar parts later. It was a great opportunity to have one of my vocal songs recorded ('How Sad For You My Love'). My favorite cut is 'How Did She Look.'"